Welcome to what is now known as a Capital Games Stanley Cup tradition. While some people grow beards for the postseason, those of us who are facial hair-challenged show our excitement in a different manner. This is when we turn to the guys and gals we run into frequently in the press box, the locker room and the local watering holes for their thoughts on each Washington Capitals playoff series. This will be an interesting one. The Bruins are tasked with the burden of repeating as Stanley Cup champions, which hasn't happened in 14 years (coincidentally, the Detroit Red Wings completed their back-to-back championship seasons by sweeping the Caps in the 1998 Final). The Caps, as currently constructed, have never been as low of a seed as they are this spring, but the seventh seed might be the best thing going for this team. The pressure is off. They can go and play and not worry about living up to expectations (although they already haven't). The series will be tough, but the Caps have proven that they can beat the Bruins, winning three of four this season. Tim Thomas vs. the Capitals: Thomas may not have had some of his finer moments this season against the Caps, but he proved last year that he can not only steal a game for the Bruins, but an entire series. If Thomas returns to his Vezina and Conn Smythe form, then the Caps are in trouble. I think the "belly rub" has jumped the shark, but in terms of goals he'll score in this series, I believe Ovechkin will score three. He will be shadowed by 6'9" Zdeno Chara, so scoring will be no easy task, but Ovechkin will find a way to break through a few times. I haven't seen Hunter without his arms crossed, so I'll go with zero. Considering that the Caps and Bruins have less than 10 Americans on their combined rosters, hopefully none, because they'll be historically inaccurate. Again, none. No one is dumb enough to get in front of a 110 mph slap shot. Toughness. The Bruins are the toughest team in the NHL. With Chara, Milan Lucic, Shawn Thornton and Brad Marchand, the Bruins are shift-disturbers of the highest degree. The Caps, on the other hand, are more retaliatory than incendiary. Washington must be able to contend with Boston's pests. Otherwise, the Bruins will wear down the Caps physically and mentally. This is a very intriguing 2-7 matchup. The Capitals have won 3 out of the 4 games this season against the Bruins, and also took both games on the road. The game that Washington did lose was during the three-game stretch that Alexander Ovechkin was suspended. Although the “young guns” have not performed the way fans have been accustomed to, they do have the ability to change games, and it will be up to Boston to find a way to shut down all four. For the first time since the 2002-2003 season, the Capitals enter the playoffs without the luxury of having home ice advantage, or even the luxury of being the favorites. This is going to be a crucial aspect of this series, because for the first time in almost a decade there is relatively little pressure for the Capitals to succeed. Everyone has pretty much counted the team out and all of the pressure will be on the Bruins to ensure they eliminate Washington and continue deeper into the playoffs. If Dale Hunter was smart, he would play up the “us against the world” theme in the locker room to fire up the team. As mentioned before, the Capitals won both games in Boston in the regular season series. This can do nothing else but give confidence to Washington. They already know they can win in Beantown and doing so will put the Bruins’ backs up against the proverbial wall. Tim Thomas vs. Braden Holtby/Dany Sabourin. Yes, there are other matchups that are going to be important to watch in this series, but I am a “defense first” person. In the playoffs you only go as far as your goaltenders will allow you to go, so in my eyes this will be the key matchup. Braden Holtby comes into this series with the same amount of NHL postseason experience as I do, and will be asked to do more than he has even done in his entire professional career. Dany Sabourin, Holtby’s backup, hasn’t seen the NHL playoffs since the 2006-07 season (as a member of the Vancouver Canucks) and only played 14 minutes in two games in those playoffs. However, Bruins netminder Tim Thomas has plenty of experience to go off of. The reigning Conn Smythe and Vezina winner has appeared in 43 playoff games, where he’s notched an impressive 26-17 record with a .935 save percentage and a 2.06 goals against average with 5 shutouts. Holtby (and Sabourin, if need be) will have to be able to stand on his head and be strong between the pipes in order to keep pace with Thomas. 2.) Right after he rips a laser past Thomas, Ovechkin starts skating away and faceplants himself on the ice just like Timmy did in the tunnel after getting beat by Brooks Laich in Boston. Too many to even start counting. Several of these references will be something resembling “the Bruins are firing more shots than they did at the Battle of Lexington and Concord!” The rest of them will be sorrowful attempts at trying to belittle the Capitals, but nobody will hear them because by that point fans in Boston will have muted their TVs and will be listening to the game on the radio. One. As Chara is winding up to let off one of his patented 100 mph slap shots, he will torque his body too hard and he will injure his groin, forcing him out of the playoffs for the year. While Capitals centers have done a good job this season considering the lack of depth, the depth at center the Bruins have will prove to be too much for the Capitals to overcome. The Bruins will be able to push the tempo better than the Capitals can and it will prove costly for Washington. The Caps have their work cut out for them. Tim Thomas is an elite goalie and could just shut down the Caps, especially considering the way he was embarrassed in their last meeting. Boston is big, physical and talented. The Caps played well in their season meetings, but the intensity will only be higher in the playoffs. Forecheck vs. Chara. Zdeno Chara is one of the most imposing players in the game, but he doesn't always like physical play being taken to him. If the Caps pressure him on the forecheck and hit him on every occasion possible, they might get into his head and get him off his game a little bit, which would be huge. Chara looking for revenge is better than Chara looking for his shot. Four. If the Caps are going to win, they will need Ovechkin to do what he does best: score goals. They won't have a prayer without Ovechkin contributing on the scoresheet. Semin, very quietly, has been one of the Caps best players recently. It seems he, above anyone else, has elevated his game -- on both ends of the ice -- since Hunter took over the team. I expect Sasha Minor to continue his good play in this series. If Hunter breaks up Ovechkin and Backstrom to off-set the Bruins defense, Semin will be the benefactor of Backstrom's immense playmaking ability. Thankfully, I won't have to hear a single one. Let's hope none. Though the Caps have certainly "bought in" to Jim Johnson's mantra of blocking shots. And we have to assume that rhetoric will only get preached harder the next two weeks. Good thing the Caps have two healthy scratches on defense just in case (knocks on wood). This series hinges on Braden Holtby staying within himself and playing solidly in goal for the Caps. It would be nice if he could steal a game (especially in Boston), but the kid just needs to play his game, avoid trying to do too much, and letting the puck come to him. Even in his good performances, he seems to be trying to make the save before it gets there. If he can avoid fighting the puck or making ill-advised plays outside the crease, he and the Caps might have a puncher's chance. The fan in me says Caps in six. The analyst in me says Bruins in five. I have serious doubts about Holtby in goal. Backstrom's return makes the Caps a lot more dangerous, but they still have yet to really catch fire. The Bruins were third in the NHL in goals scored per game, sixth in goals allowed and third overall in 5-on-5 goals for/against ratio. That's darn solid, and with as maddeningly inconsistent as the Caps have been, it's impossible to predict which team will show up on a nightly basis. The Caps have been playing "playoff hockey" since Dale Hunter took over, though, so it'll be interesting to see how they respond now that we've actually reached the playoffs. Both teams got the draw no one wanted -- the Capitals were viewed as a dangerous lower seed, and the defending Stanley Cup champions were viewed as the one team the Capitals should avoid at all costs. Knocking off the Bruins would give the Caps a dynamic, take-charge moment that they haven't had since October. But it won't be surprising to see either winner emerge exhausted. Tim Thomas vs. White House Press Secretary Jay Carney. Ovechkin-Chara is anything but a sidebar to this series. While the Bruins possess balanced scoring across three-plus lines, the Caps will need their best player to somehow find time and space while on the ice against Chara. Meanwhile, everyone recalls what Thomas meant to the Bruins' Cup run one spring ago. Matt Hendricks is uniquely qualified to play the role of power-pest about Thomas' crease. The Caps must get traffic in front of Thomas to have a chance. Here's the sobering line on Ovi vs. the Bruins this season: 16 shots, three points (all assists) in three games. It wouldn't be surprising to see Ovechkin, since he'll have that incredibly massive shadow known as Zdeno Chara for much of the series, be forced to set up more than score thanks to the lack of good looks that he'll get. It's unclear how much, if any, time Ovi will receive paired with newly returned Nick Backstrom, and that might change a top-line dynamic from the regular season contests. Something to perhaps look for in getting Ovi going against the B's impressive blueline corps: Brooks Laich has developed a habit of winning big draws, and the Caps' coaching staff is often placing Ovi in positions to take advantage of that -- think back to Laich's draw win in Saturday night's opening 30 seconds. None. Dale Hunter is Alexander the Great to the Gordian Knot that is Alex Semin, who is perhaps the most individually improved player under Hunter's tenure. Hunter's rule seems to be pretty straightforward: if you don't play responsibly, you sit. Hunter may be the only person in Washington who hasn't wasted time scratching his head over Semin. Edwards rubs some people the wrong way with his broadcast histrionics, but at least some of us find his calls endearing, and there can be no doubting his passion for the game. Of course, we don't have to listen to his calls 82 nights a year. Not that we want anyone to get injured, but let's just hope that there are enough Caps taking pride in standing in front of the net to make getting hit by a Chara slap shot a possibility. Big Z, though, can bring it from the point like few in this game can. His howitzer is a serious incentive for the Caps to stay out of the penalty box. Coaching ... and karma. Claude Julien is a Stanley Cup winner. Dale Hunter is NHL-unproven. The Capitals have a lot of talent but little postseason success to show for it. If they can make it out of this round playing against the defending champs and a team that breathes playoff hockey, Hunter should get much of the credit for having the Capitals playing the right way. And with respect to karma, it's been OFB's position for years that the Caps have looked uncomfortable skating in spring with the label of Expected Winner. Does their being an underdog work to their advantage in this series? Will at last they play up to their potential in the postseason when hardly anyone expects them to win? Yes, the Caps are in the playoffs but they have as tough a road as imaginable. Should they eliminate the defending champs on the road, they’ll then get the Eastern Conference champion Rangers and possibly either the Flyers or Penguins after that. You only need one hot goaltender to get you through, but the Caps don’t have one, and if they do, he’s not currently healthy. Nick Backstrom against the Boston defense. What impact Backstrom has in his return dictates what impact Ovechkin has as well. Caps are gonna need some goal scoring to win this matchup. Healthy goaltending for the Capitals and the previously mentioned Backstrom. After the way this season has gone, one would imagine that of the three potential playoff scenarios on the last day of the season, a first-round date with the Bruins was the one the Caps wanted least -– which is fine, because it’s likely that the Bruins feel almost the same way about the Caps. Can't imagine that between the Caps and the Senators, Washington was their first choice. This is a tough one to figure out, though. It’s an underachieving team against the reigning champs, an inexperienced coach against a Jack Adams winner, a former Richard Trophy winner on a down year against a former Norris Trophy winner … but at the same time, the Caps won the season series and didn’t seem outclassed in any of their three wins (although as we all know, regular season doesn’t mean a whole lot come springtime). There’s a chance the Caps actually show up, do what a lot of “experts” think they won’t and take it to the Bruins; they may even win the series. There’s just as good a chance they try and float through the series like they seemed wont to do through large portions of the season and get embarrassed. Chara vs. Ovechkin: Sure, the goalie duel will be interesting, and the matchup of depth players is sure to make people tune in, but there are few battles better and more entertaining than the ongoing war between Big Z and Ovi. They’re never afraid to hit each other, it’s a coin toss as to which one falls down when they do, and both of them seem to have a mutual respect that fuels the competition. Uh, 4 belly rubs. On ice. What a man does in his own home is none of my business, right Timmy Thomas? None. If Dale’s still scratching his head after coaching Semin for more than half a season, he hasn’t been paying attention... plus he doesn’t strike us as the head-scratching type. We’re more likely to see blank stares from Hunter when Semin does something stupid. And blank stares from Hunter when Semin does something great. It’s the playoffs, so one would assume he’s upped his game just like everyone else and expanded a bit -– let’s say three Revolutionary War references, one about the Battle of 1812 (complete with a gleeful mention about the burning of Washington) and an obscure reference to the Fenian Raids. If it’s any, we won’t know about it until long after the series is over … unless his shot removes a limb, these guys are going to keep playing (and Brooks Laich would likely keep playing even if it DOES remove a limb). Braden Holtby. He’s had flashes of brilliance intertwined with embarrassingly bad moments during his brief NHL career, but if he can step up and steal a game or two, it would be a huge difference-maker for the Caps. Here’s the deal: the Caps should lose. They haven’t won consistently all season, the Bruins are the defending champs, and Washington is starting a rookie goalie. To make matters even worse, the Caps are one of just two playoff teams that have allowed more goals than they’ve scored this season. Doesn’t sound like a winning playoff recipe to me. That being said, I like that the Caps are in the underdog role in the postseason for the first time in a while. Hate to be simple, but it’s Ovechkin vs. the Bruins. In 41 Caps wins this season Ovie had 48 points. In 37 losses he has 17 points. You do the math. He’s a history buff, come on! The man is 7 feet tall on skates … most intimidating player in the NHL. Gregg Williams would tell his players to go for the ACL. Too soon? Boston has won enough championships recently. That is really all I've got. If the Caps get to the second round I'll be way more detailed and slightly more insightful in my breakdown. But Boston does not need another championship. Oh, and check out this video of Tim Thomas getting embarrassed by Matt Hendricks a couple weeks ago. Braden Holtby vs Tim Thomas. I know, I know, goalies don't typically match-up against one another. But I am predicting a goalie fight at center ice after Holtby shows Thomas that video of when he was embarrassed by Hendricks' shootout maneuver from a few weeks back. OK, I don't really think that's going to happen, but it sounded cool. Here's why I went with the two goalies: In Thomas you've got a veteran who has seen everything and who hoisted the Stanley Cup just last season. He's the reigning Conn Smythe and Vezina trophy winner. In Holtby you've got an unproven kid who is barely old enough to drink. For the Capitals to have any chance of upsetting Boston at all, Holtby has to be as good as Thomas. So are they matching up against one-another? No. But with the postseason coming down to goaltending, I think the better of the netminders propels his team to Round 2. Assuming we're talking about how many goals he'll score, and accidental non-goal stomach rubs don't count, I'll go with four. I have a calculation for this. Number of games (7), plus number of periods (21), minus Semin's jersey number (28), plus Hunter's old jersey number (32), minus Brook Laich's current jersey number (21). By doing that math you get 11. Then because he's Alexander Semin, you add one. So with that all being said, he'll make Hunter scratch his head 12 times. Pre-game of games 1 and 7. So let's go with two. I sincerely hope the Caps stay healthy during this series, but with Jay Beagle and Matty Hendricks sliding around to block the puck, you have to imagine somebody's going to skate off gingerly after taking a 106 mph fastball off the leg. If you look at where the Caps got their goals in the season's earlier matchups with the Bruins, it wasn't generally from the team's top line or elite scorers. Mathieu Perreault had a hat trick against Boston and Marcus Johansson scored a pair of goals against the B's this season, as well. Hendricks and Beagle both lit the lamp in Washington's season series with Boston, too. I fully anticipate the Caps' checking line to create some quality scoring chances and a couple of non-stars to have opportunities to elevate their popularity in this series. I like Perreault and Johansson to combine for four goals in the seven games. The Bruins will benefit from having won the cup last season, and will have an easier time playing calm, relaxed hockey as the series progresses and the games become more pivotal. Having home-ice advantage in a series that I think is destined to go seven games makes it almost impossible for me to pick Washington. The Bruins can't be thrilled to draw a team that beat them three times in the regular season, but the defending champs are solid, deep, strong and confident. The Capitals will have the advantage of low expectations, but that's more of a psychological trick than anything else. Talent difference throughout the lineup is vast. Alex Ovechkin vs. Zdeno Chara. Chara takes pride in shutting down stars like Ovechkin, and Ovechkin takes pride in lighting the lamp in the playoffs (25 goals in 37 games). Patrice Bergeron. He's too good defensively and in the faceoff circle for the Caps to handle. And he can help out on offense. A very intriguing match-up that I'm sure many people expected to be an Eastern Conference Final series before the season started. I also think many Boston fans were steeling themselves for a match-up with the Ottawa Senators (against whom the Bruins have had much better luck this season) before the final week's results vaulted Washington into the 7th seed, so there's some extra fear giving this one some edge. Has to be the goaltending match-up. Tim Thomas has turned in a very solid .920 save percentage and a 2.36 GAA this year, but that's still a level below his other-worldly performance in 2010-11. On the other side, Braden Holtby has all of 21 NHL games under his belt over the past two seasons. Raising the stakes even higher is the question of who will be the back-up guy if either man struggles. The Bruins would likely have to turn to either a less-than-100 percent Tuukka Rask or Anton Khubodin, who has exactly 7 games of NHL experience. The Capitals' fallback guy is likely Dany Sabourin (who was called up on Monday, which signals to me that Michal Neuvirth is pretty close to a no-go), who last played an NHL game in 2009. Five -- four times because he's just scored a goal, and once because he went overboard on the red snow crab legs at the Summer Shack in Cambridge. Six -- four times because Semin just committed a lazy stick penalty and twice because Hunter listened when Semin told him to use the generic brand of shampoo instead of Head & Shoulders. You should have listened to Dougie Gilmour, Dale! None. Since Jack is a historically literate fellow, he'll have moved on to War of 1812 references in the hope that the sequel to Boston's first Stanley Cup in 39 years will mirror the sequel to the actual American Revolution. Look for a "they're bombarding Holtby/Thomas like he's Fort McHenry," a "Washington is burning again" if the Bruins wrap up the series on Verizon Center ice, and an in-depth comparison of the handshake line to the signing of the Treaty of Ghent. After watching both of these teams' attempts at power plays over the past six months, my guess is that more injuries will be suffered by fans punching themselves in the jacobs (and I don't mean Jeremy) just to try and feel something again than by anyone on the ice. The Bruins went 2-5-2 in afternoon games at TD Garden this year. Games 2 and 5 are both afternoon games at TD Garden. I know, I know, coincidence is not the same as causality, but still ... it's interesting. Also, the key non-goaltending question will be how the second- and third-pair defensemen for Boston deal with the threat of Washington's top line (especially in the home games, when Dale Hunter has the last change). The same question applies to Washington's second and third-pair defensemen (especially John Carlson, who has re-defined the term 'sophomore slump' this season) when they are faced with Boston's scoring depth. Boston in 7 games. The aforementioned scoring depth and a just-good-enough performance in net from Thomas will be enough to overcome a very tough Capitals team. My first reaction when the matchup was established was that I did not want the Caps to play the defending Stanley Cup Champions. The Bruins have experience at winning in the post season and they have two players who are among the best at their position in the entire league in Zdeno Chara and Tim Thomas. However, Boston has been the hunted all season and they will have pressure to win again. The Caps have had a sub-par regular season, but outside of in net, they are healthy at the right time. One would have to think the Capitals have yet to play their best hockey simply because they have had key injuries. Boston's best stretch came in November and December when they were nearly unbeatable. There are lots of good forwards on Boston, but to me, the most important one is Patrice Bergeron. From a media standpoint he is an "under the radar" guy but everyone in the NHL knows how good this guy really is. No. 37 makes it happen for Boston, and if Washington can find a way to slow him down then that could prove decisive. This series should be a very tight-checking one, and to me the team that takes care of the puck the best will win. Alex Ovechkin vs. Zdeno Chara. There is no doubt that No. 33 loves playing against the Great 8, and he will use his stick and size to try and slow Ovechkin down. Alex has a major speed advantage so Dale Hunter will need to try to find a way to get Ovechkin moving when he is approaching Chara. Alex also has to find a way to effectively use his teammates. His play away from the puck will be key to this matchup. If he plays strong in his own zone and creates some turnovers, he will get breakaways and/or odd-man rushes. If he doesn't bear down below the blue line then he will be easily neutralized. None, Alex Semin has been super under Coach Hunter and is a key to the Capitals success. Semin has a history of playing well against Boston and his shot gives Thomas fits. I expect No. 28 to have a super series. The question is can he stay healthy? He tends to get banged up in the post season and then his play has tailed off after that. Two (see my series prediction below). After this series though, Edwards will need to brush up on his Civil War history because the Bruins will feel like the losers in the Battle of Antietam when they are overrun by Washington's sea of red at the Verizon Center in games 3, 4, and 6. 1. Some Capitals penalty killer will get nailed by that blast at some point. So it is very important that Washington stay out of the penalty box. The difference, after turnovers, is going to be goaltending. If Braden Holtby remains composed and plays the way the whole organization knows he can play, then the Capitals have a chance to advance. No. 70 must be smart on when to be aggressive and help his defense by moving the puck. The Bruins are big and like to pound defensemen so Holtby's stickhandling could neutralize the forechecking ability of Milan Lucic and Brad Marchand. Tim Thomas runs hot and cold. It is vitally important that the Capitals get a lot of traffic on him. He can be rattled and guys like Matt Hendricks, Joel Ward, Troy Brouwer, and Brooks Laich need to do that by crashing the crease. The Caps are gonna shock the world and win this one in six games. This is not a bad matchup for Washington and they will have to use their speed guys like Marcus Johansson and Jason Chimera to take advantage of Boston's defense. The Caps made the playoffs? The only matchup that matters is Alexander Ovechkin versus Zdeno Chara. Ovechkin has a few things in his favor. First, he's been a beast in the playoffs, connecting for 25 goals in 37 career postseason contests. Only Mario Lemieux (.710) has a higher playoff goals-per-game average than Ovechkin's .676 mark. Ovi also salvaged his 2011-12 season with 12 goals over his final 16 games. He's peaking at the right time. That's the good news. The bad news? Zdeno Chara crushes puny humans. The Capitals need to chip the puck behind Chara and batter the behemoth blueliner, and the self-proclaimed indestructible Russian machine must spearhead the charge, demonstrating a willingness to get the puck deep and work. Ovechkin needs to be the hunter, not the prey. If he punishes Chara, Ovechkin will give his teammates the courage to do it too. Each hit on Chara is an investment, like working the body in a heavyweight fight. All those hits add up over the course of a seven-game series. But will Ovechkin be willing to take the punishment and make the physical sacrifice? Ovechkin rubs his belly during games? Wow, he must really miss Bruce Boudreau. So wait. You're saying Semin has lice? Jack Edwards is why remotes have mute buttons. Character. The Bruins have it. Do the Caps? Defending Stanley Cup champions rarely get bounced in the first round, with muscle memory and strength of will usually enough to see them through. Fatigue doesn't set in until the second round. By then, the Caps will already have dimes on their eyes. Ted Starkey, author of "Transition Game" and "Red Rising"
This first-round matchup is a battle between two teams that have both thrilled -- and frustrated -- their respective fan bases at times this year, looking like Stanley Cup contenders at times, but also looking pretty mediocre at times. Washington started out the season going 7-0-0 and dominated much of October, but injuries to Mike Green and later Nicklas Backstrom contributed to what would be a 35-32-8 finish to the season for the Capitals, leaving them two out of the Southeast title and in seventh seed as the playoffs begin. For Boston, who stumbled out of the gate in a bit of a Stanley Cup champion hangover, went 12-0-1 over the month of November to move into first overall in the East -- until a mid-January visit to the White House (along with an injury to Nathan Horton) -- caused the Bruins to fall out of that perch and with a pedestrian 18-16-1 finish to the campaign. The good news for both teams is they did finish the last stretch of the regular season strong, with the Caps going 10-4-2 in their last 16, while Boston went 9-2-1 over its last 12. The two teams have been among the upper echelon in the East the last few seasons, narrowly missing a playoff meeting in 2009 when both lost Game 7s in the Eastern Conference semifinals, and again last year as Tampa upset Washington and eventually fell to the Bruins en route to Boston's first Stanley Cup title since 1972. This season, the Capitals won three of four matchups with Boston, missing Backstrom, Green and even Alex Ovechkin over the course of the second-half matchups, and the two figure to produce a tight series in which both teams will look to capitalize on the others' mistakes. The Bruins also likely will try to play a physical style against the Capitals, and Washington -- who hasn't really embraced a tough style of play -- will have to respond. Alex Ovechkin vs. Zdeno Chara: While Ovechkin isn't scoring goals at quite the clip he used to -- he scored 38 this year, second-lowest in his NHL career -- he still is a dangerous playoff performer with 50 points in 37 career playoff games, notching 10 points in 9 games last season. Chara is one of the NHL's best shut-down defensemen, towering at 6-foot-9 and having won the Norris Trophy for the league's best blueliner in 2009. Chara is able to use his ample frame to slow down and get in the way of opponents, and certainly Bruins coach Claude Julien will look to match up his top defenseman against Ovechkin when he's on the ice. Chara has been somewhat effective in slowing down the Caps' star, but still Ovechkin has produced 12 points (4 goals, 8 assists) in his last 11 games against the Bruins. While at TD Garden, Julien will have the last change, meaning it will be important for Caps coach Dale Hunter to try to find opportunities for Ovechkin to skate without Chara on the ice -- which isn't easy with the defenseman logging an average of 25 minutes per game. Ovechkin should find some success against the Bruins, lighting the lamp four times over the course of the series. It will also be important for Ovechkin to feed the puck to his linemates, since he certainly will be drawing Chara's attention for most of the game. One of the key players with Ovechkin being closely watched will be Semin, who has been good at times this year and will need a strong series to give the Capitals a chance to advance. Figure the Russian will be on his better side this time around, and will keep the head-scratching to three times. With Washington and Boston duking it out, you can figure in at least the three games NESN gets in the series you will have at least a two-per-game output. Battle of Lexington, Paul Revere and Bunker Hill all figure to find their way onto New England cable boxes this round. With the Caps blocking shots at a better clip lately, you figure that a Capital might get at least a stinger off the 106 mph slapshot -- as the defenseman uses it to try to create chances and keep defenders honest. The biggest question that likely faces the Capitals is their ability to finish opponents, as the Bruins showed last season a lot of adversity in their playoff run, erasing deficits in three of four series en route to the Cup. Washington is going to try to at least gain a split in the first two games in Boston and capture home ice for the remainder of the series. If the Capitals get a lead, they need to be a little smarter with the puck and not sit back and let the Bruins challenge young netminder Braden Holtby. Too many games down the stretch the Capitals built a lead in a contest and dared its opponent to score, and it had mixed results -- including a blown 2-0 lead in Boston -- and the Capitals need to generate some flow to keep the puck out of their zone and limit chances against their own netminder. If the Capitals gain a lead in the series, they certainly cannot afford to become complacent and let off the gas pedal, as the Bruins have shown, they are quite capable of coming back to win a hard-fought series. Have the Caps turned the corner and broken out of their season-long malaise now that it's the playoffs? Can everything that went right for the Bruins a year ago happen again? How much will Boston miss Nathan Horton's presence? Washington's goaltending situation is very hairy at the moment. The Bruins can rely on Tim Thomas in net and you can say the series is over after just looking at both creases. Tim Thomas vs. a potential Verizon Center visit by President Barack Obama. Five goals for Ovi. Sadly, no wild celebrations after each one. He'll have bald patches by the end of the series. 0. Everyone knows they need to get out of the way. Michal Neuvirth, Braden Holtby, Jan Hrivnak or whoever ends up in the Washington goal. They'll decide if it's four games or seven. This is one of those series that can go either way: the Bruins could take this one handily, or the Caps can take it to the distance. The B’s are the team with the motivation and a lot to prove to show that they can repeat, but the Capitals still have a chip on their shoulder to make a run and want to use that motivating factor to propel them to a win. Boston is better equipped on paper to move on, but with the resurgence of a lot of the Caps best offensive players and if the goaltending depth returns this series, Washington could be more than the Bruins bargained for as a first-round opponent. The most obvious matchup to watch is Alex Ovechkin vs. Zdeno Chara, which is true, but let’s also consider that the Caps will need others to step up. Recent re-addition to the lineup, Nicklas Backstrom, will be key in this task to help produce some subsequent offense. 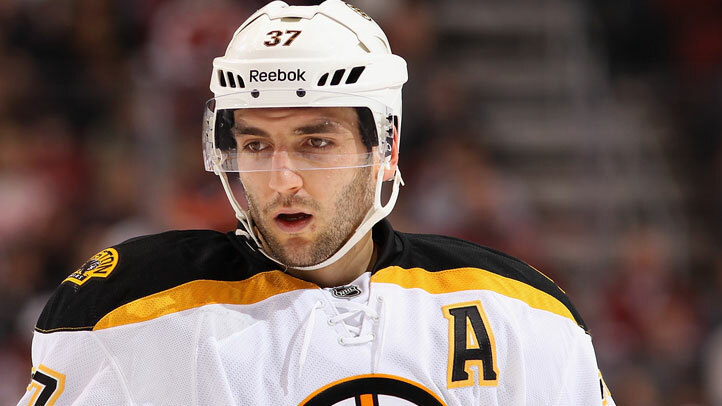 Facing against him at the same position: Patrice Bergeron. Bergeron not only had a successful year offensively, but showed his two-way skills this season leading the league in plus/minus stats with plus-36. Watching what he does against Backstrom, as well as in the faceoff circle where he was also successful will be an interesting matchup while Ovechkin tries to run over the wall that is Chara. I’m also curious to see who goes up against the Bruins fourth line. Dale Hunter has put a lot of trust in his checking line, which includes Jay Beagle and Matt Hendricks and gets basically third- line minutes. If the Caps’ top line faces a stalemate in this series against Boston’s 1a or 1b line, can the Caps shut down the other lines the Bruins have, especially a possible setting of Lucic- Krecji-Seguin? Three – an extra time for the cameras if the Caps win. Zero, because Semin has been playing just fine lately. If he “disappears” in the playoffs that means everyone else has disappeared as well. Four to 10 ... could be as high 20, maybe 60. If we reach 1776, shots on me. Maybe one “lower body injury,” but I’ve got maybe three “upper body injuries” that will last at least a bit of time to shake off. Matchups: What killed the Capitals last season against the Tampa Bay Lightning was the team’s lack of adjustments -– on the ice by the players or by the coach. To Dale Hunter’s credit, he has done well in at least making attempts to match up players on the ice and changing the plan when necessary. Still, the Caps lack a shutdown guy on the backend, and there is only so much the goalies can stop. Both teams have the will and motivation to want to win this series; however, it’s possible that no matter what the Caps try to do, the Bruins will be a bit much for them, unless the absolute right matchup is made. The Caps will have their hands full with one of the deepest teams in the NHL. Few squads possess the depth Boston has up the middle and Washington will be hard pressed to match the Bruins physical game around both nets. To have a chance at knocking off the defending Stanley Cup champions, the Caps will need their best players (here’s looking at you Alex Ovechkin, Alexander Semin, Nicklas Backstrom and Mike Green) to raise their respective games and find a way to crack all-world goalie Tim Thomas. Boston plays to intimidate and it’s likely they’ll attempt to bully the Caps into submission. Dale Hunter has tried to implement a hard-nosed mentality into his team. We’ll quickly discover just how successful his efforts have been when Washington steps into the ring for a full series against a true heavyweight. The Capitals best line down the stretch hasn’t been one featuring Ovechkin. In fact, the unsung third line of Matt Hendricks, Jay Beagle and Troy Brouwer has been the sparkplug. It’s likely Hunter will send out his third line against the monstrous Milan Lucic and his linemates whenever possible. The rugged winger has been a nightmare for opposing teams around the crease and ought to be even more valuable in the postseason where he can wreak havoc throughout an entire series. The third line won’t be in the spotlight, but if the Caps are to win, it will be in part due to the job they do in containing Lucic. As key as the Caps third line will be, Ovechkin will determine just how far the Caps can go in this one. He’s no stranger to individual postseason accolades and I see him adding four goals to his current total of 25 career playoff tallies. Semin has failed to live up to expectations in the postseason thus far, but I’ll say this is the year he puts it all together after a strong effort since Hunter’s arrival. Since Thomas’s political views are as unorthodox as his playing style, Edwards will probably wax poetic about the capture of Bunker Hill at least once in the Nation’s Capital. Brooks Laich might want to think twice before jumping into the path of a Chara laser. Then again he might not want the puck finding Braden Holtby since journeyman Dany Sabourin might be the only other option in goal. Net presence. In the playoffs, the team that physically its their will around both nets has a substantial advantage. The Bruins thrive on swarming the crease and the Capitals will have to offset that with some toughness of their own. Bruins in five. They’re too big, too deep and too tough. Washington’s lack of goalie depth and inability to consistently play defense will cost them in a seven-game series against a team this disciplined. Most are thinking this is a Bruin blowout. If the Caps' second-, third- and fourth-liners show up and play physical, the blowout won't happen. Ovi-Chara. In reviewing the past few match-ups Ovi has tried to skate through the giant. Look for Ovi to find a new way around. The real question is can he rub his belly and pat his head? 10. The real question is will Dale Hunter scratch Semin? OK, enough with second-guessing the questions. This could be the year Semin doesn't end up on a milk carton in the postseason. The power play has to be better if the Caps want a chance and Sasha is the key. Noted at practice Monday, while one Cap was on the bench another yelled to him, "Hey Sasha!" The team is tired of the disappearing act, too. Doesn't matter as long as he leaves Castro out of it. Three and probably Matt Hendricks in the face. That guy gets more face wounds and heals faster than anyone I've seen. Mike Green. He missed 50 games this year! If he can handle the physical play, push the puck on the breakout, and distribute on the power play, the Caps can challenge the Bruins. Sorry Caps fans. I hope your team proves me wrong.